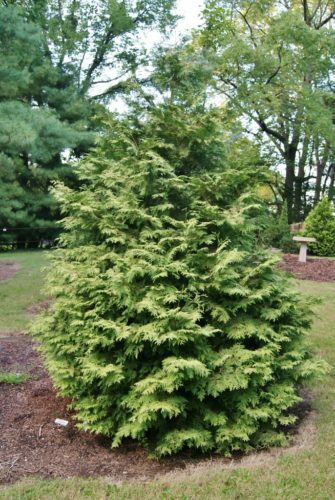 Thuja occidentalis 'Enlightened' is a recently-introduced, extremely landscape-worthy selection of American (eastern) arborvitae. Although not very impressive as a very young plant, after five years in the garden it will begin to show it's true beauty. 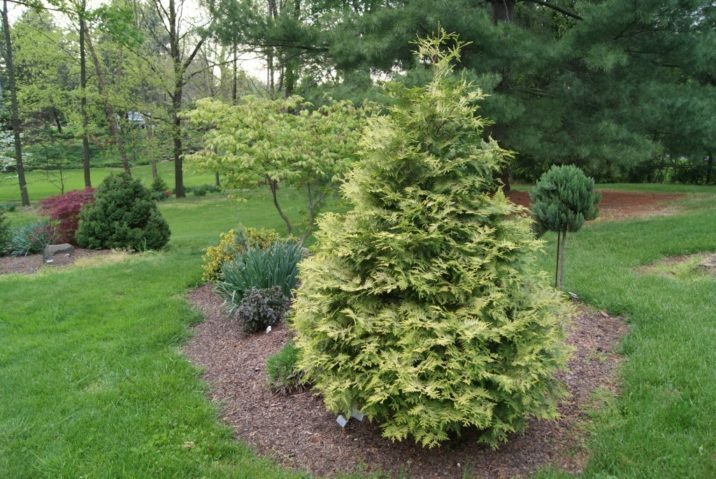 Foliage color is not yellow or gold as are many other arbs, but is a light, mint-green, variegated with lighter platinum-cream which shows best when given several hours of sun each day. 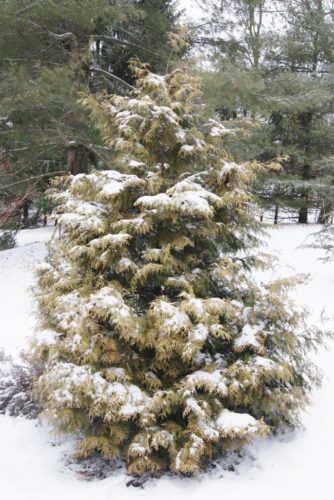 It's color value is similar to Pinus densiflora ‘Oculus Draconis.’ In winter, Enlightened's color is cream and caramel with olive-green undertones where it is untouched by sun. This beautiful arb did not burn even in the midwest U.S.'s severe hot, droughty summer of 2012 with over 45 days of temperatures over 90°F (32ºC) and most near 100 (38°C). Typical rate of growth in most areas is 8 to 12 inches (20 - 30 cm) a year resulting in a flashy broadly conical tree 12 feet (4 m) tall by 8 feet (2.5 m) wide after 10 years in the landscape. Dr. Clark West (1918 - 2014), hybridizer and seed collector from Cincinnati, Ohio is credited with the origin and introduction of this cultivar. 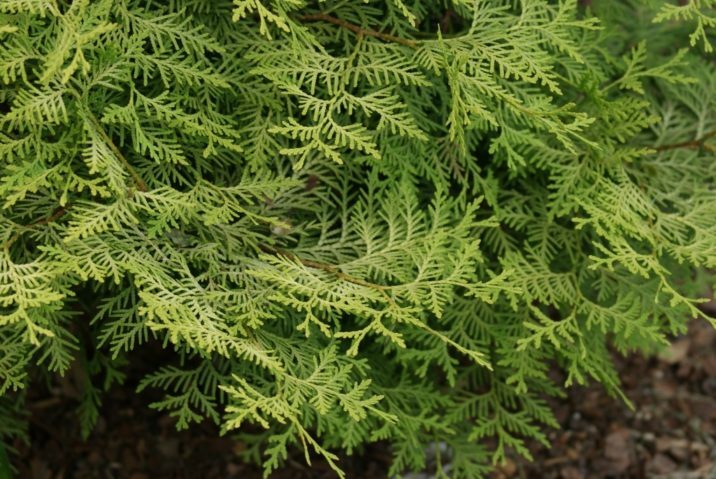 The plant was grown from a batch of seeds he collected from Thuja occidentalis 'Marissen's Sulphur' while on an ACS trip to England in 1995. As the seedlings grew, he made this and other selections, then distributed the young plants to collectors and botanical institutions for further evaluation. Terri Park of Carmel, Indiana was a lucky recipient of one of the original propagations. She named it, and officially registered the cultivar with the Royal Horticultural Society in 2012. 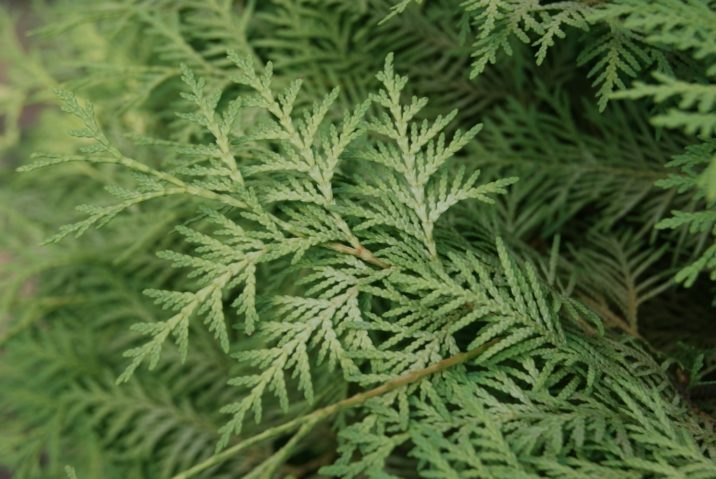 At the time of writing this record in 2014, fewer than 20 individual specimens of this plant are known to exist in the world, making it, for now, virtually unknown in the nursery trade. An informative account of the Doc West's life and career can be read here. 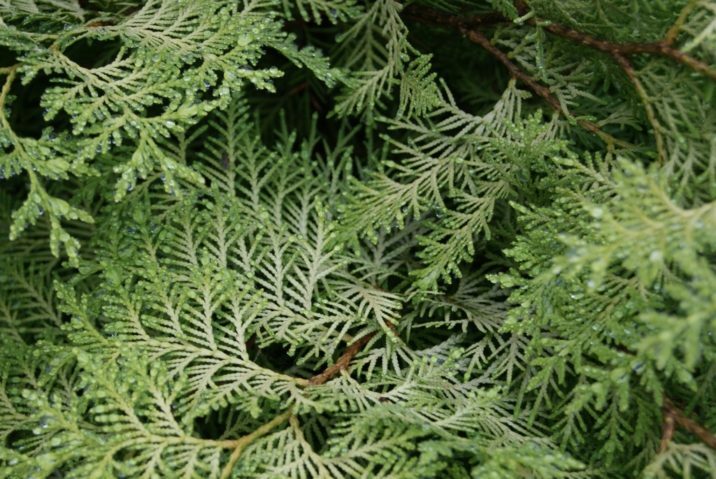 Thuja occidentalis 'Enlightened' photo taken September 2014 in the garden of Jay and Terri Park, Carmel, Indiana. 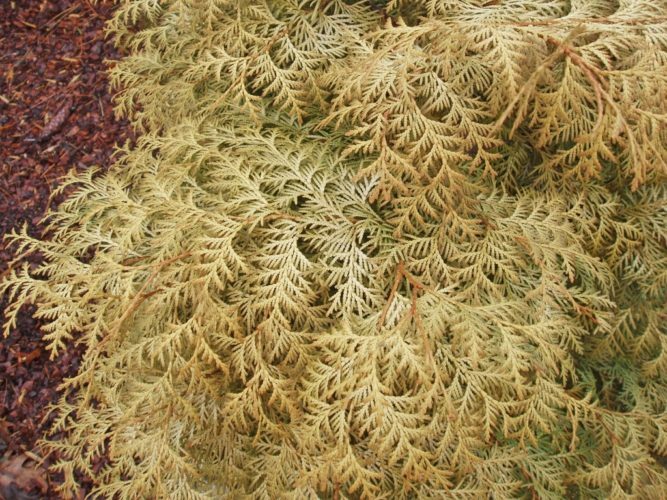 Thuja occidentalis 'Enlightened' — photo was taken in January 2010 showing winter color of caramel and cream in the garden of Jay and Terri Park, Carmel, Indiana. Photo taken April 2010. New growth pushes with chartreuse outer color and platinum cream color nearest the stems. 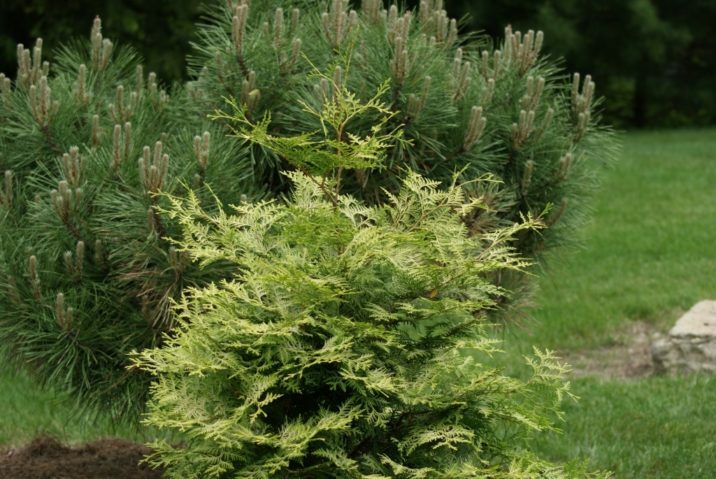 Photo taken April 2010 in front of Pinus nigra 'Globosa' for color comparison. Photo taken May 2010. Color is changing to light mint green and platinum. Photo taken July 2011. Summer color is cool mint green and platinum. Photo taken February 2014. Overall color of caramel and olive under color. Foliage did not burn. Photo taken April 2012, showing bright chartreuse and platinum spring color.